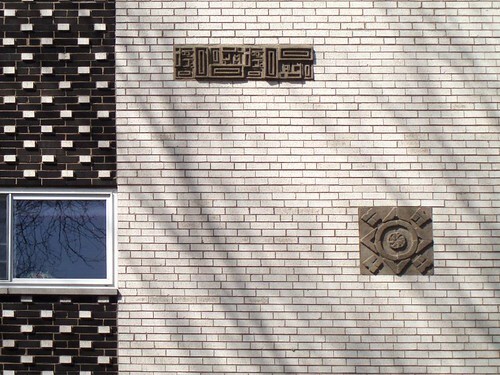 Within the span of a week, I discovered two totally separate uses of an unusual architectural product, a sculpted square concrete block inscribed with an artistic pattern of rectangular shapes. 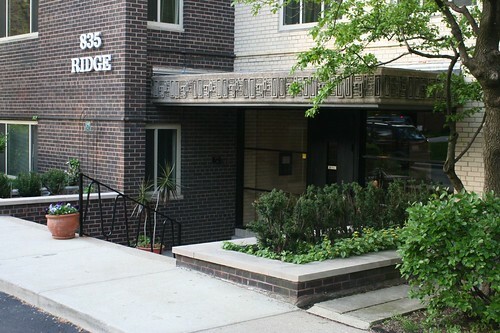 This example is used on the entry overhang of a four-plus-one apartment building on northern Ridge Avenue in Evanston, where its use vaguely evokes the image of an Aztec temple emerging from the jungle. 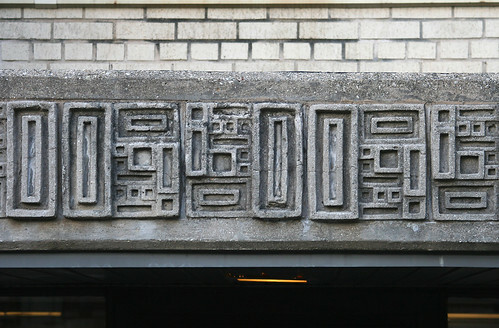 The same design is used on the stairwell decoration panel on a 3-flat on 55th Street near Midway Airport. In both cases, rotating the block allows its complex patterns to overlap and interweave between blocks, erasing the distinction between the individual blocks and obscuring the fact that this is simply one design repeated over and over. The blocks certainly owe a heavy debt to the concrete textile blocks used by Frank Lloyd Wright in several of his California houses. Considering the 1950s fascination with the glamor and style of California living, the connection isn’t too surprising. 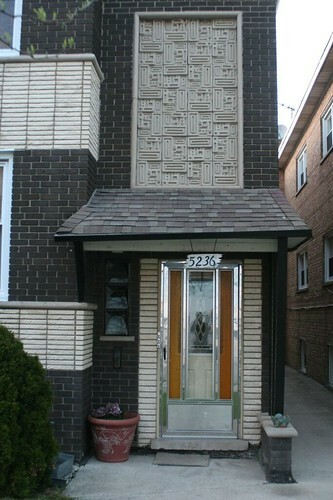 This entry was posted in 4plus1, Architectural Ornament and Materials, Sculptured glass block. Bookmark the permalink. The funny coincidence is that the Evanston one is a building I used to visit quite frequently as a child. My parents had friends that lived in that building. The last time I was there was about ten years ago. You can bet that I never paid attention much to its details or anything. It is great to notice a different aspect again! The people have long since moved out.